The combustion method incorporates the use of our portable combustion units. 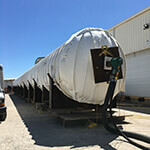 Combustions units consist of 6 MM BTU gas trains, 20 HP Blowers and High Velocity Burners. Zentech burners are specifically designed to deliver the amount of heat required, commonly 1-6 million BTUs per hour and feature multiple safety interlocks and redundancies. Post-weld heat treatment (PWHT) tempers the metal and reduces tensile stresses, minimizing the risk of brittle fracture, stress and corrosion cracking and metal fatigue. It is vital that this process is carefully controlled, because it maximizes the durability of your process equipment. If you use your equipment in harsh environments, this is particularly important. Zentech’s advanced control technology achieves the precise control needed to get the most benefit from the treatment. Our experienced technical team ensures the structural integrity of your vessel or unit during treatment. 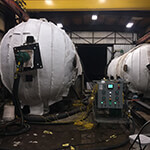 All areas of a refractory must be heated under very precise conditions to maximize its life span, and Zentech’s high-velocity combustion systems get the job done. We remove both free and chemically held water, prevent the formation of thermal stresses, minimize the potential for slip plane, and assure cross-sectional ceramic bonding, all to promote better refractory longevity. Forced curing minimizes the need for reapplication and dries coatings and linings of baked phenolics and epoxies quickly and thoroughly. This improves both their quality and durability. The controlled and uniform heat distribution of a Zentech high-velocity combustion cure gets your equipment online quickly—our forced curing does in hours what it takes days to do without! We also eliminate hot spots and ensure conformance to the manufacturer’s recommended heat schedule. Zentech knows that process heaters are designed for a small range of temperatures close to operating temperatures, which is not ideal during a start-up. Zentech’s high-velocity combustion systems feature exceptional turndown ratios 100:1, which allow operators to vary heat output from low intensity to full blast in increments as low as 1° F/hour. This precise control minimizes thermal stress and ensures long run-times in cyclone boilers, coal fired boilers, steel mills, glass plants and other process applications.